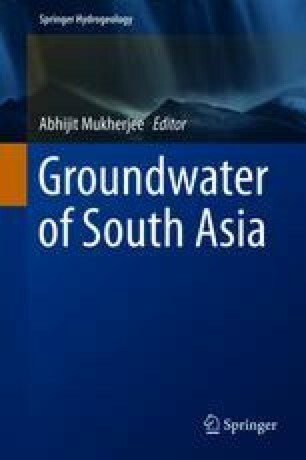 The coastal population of Bangladesh has already been suffering from the salinity encroachment both in groundwater and surface water regime. Reduced river discharge, coastal surges, shrimp farming, lowering of groundwater table due to dry season irrigation in a large part of the country accelerate the rate of saline water distribution. In addition, sea level rise, due to the impact of climate change, may contribute to salinity encroachment on coastal freshwater resources, particularly in the shallow alluvial aquifers. Though the groundwater table is within 2–5 m below ground surface, availability of fresh and safe water in the coast is very limited in upper aquifers because of the arsenic contamination and water salinity. For the coastal population, deep (>250 m) tube wells are the main source of drinking water and irrigation water supply is mostly restricted to surface water including rainwater. In monsoon, freshwater pockets are available at the shallow depth (<8 m) from seasonal precipitation but mostly turn to brackish condition during dry period. Therefore, assessment and monitoring of development stress and probable impact of climate change on freshwater resource are utmost important. The main purpose of the study is to assess the impact of climate change and development stresses on the availability of fresh water resources in the coastal area. For that purpose, integrated hydrological model has been prepared describing the subsurface condition both the saturated and unsaturated zone together with the influence of various water components of the hydrological cycle. Groundwater salinity models are developed to simulate salinity transport in the sea, river and through the porous medium of aquifer for a range of existing and possible future conditions. It has been seen from the simulation result of the model that under climate change condition during the month of March and April, the salinity level is highest for all river system within the study area and significant during period from December to June. The climate change scenario illustrates that the groundwater level increases within the range of 0.6–0.8 m under climate change scenario. Movement of salinity is found insignificant from the river to the aquifer. Major rivers in the south central coast there is a considerable interaction between surface water and groundwater due to the tidal effect. On the other hand, there is negligible interaction between the aquifer and adjacent river in the south-eastern coastal plain. Bangladesh Water Development Board (BWDB), Bangladesh Climate Change Trust (BCCT) and Institute of Water Modelling (IWM) are highly acknowledged for supporting the research on assessment of coastal water resources. Professionals and officials involved in the project activities are also acknowledged for their valuable contribution.